From the author of the #1 bestselling cookbook The Busy Mum's Guide to Weight Loss comes this timely guide to losing weight while eating well and saving money. Rhian Allen, founder of the online sensation The Healthy Mummy, brings you this failproof plan to help you take control of your budget and save money on your weekly shop while feeding a family. Create delicious and flexible meal plans with more than 120 great new recipes, including breakfasts such as Gingerbread Pancakes, Salted Caramel Porridge and Zucchini and Bacon Muffins; lunch and dinner options such as Pulled Pork with Tzatziki Salad or Cheesy Chicken Meatballs in Tomato and Spinach Sauce; and indulge in desserts, such as Peppermint Choc Slice and Pecan Nut Fudge, that will satisfy even the sweetest tooth. All recipes come in at under $2.50 per serve! 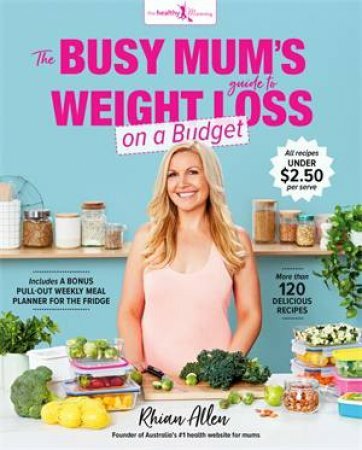 Filled with bulk cooking hacks, clever shopping and kitchen tips and including a pull-out, customisable weekly meal planner for the fridge, The Busy Mum's Guide to Weight Loss on a Budget is your go-to-guide to losing weight and keeping yourself and your family healthy on a budget.